The occipitotemporal/occipitomastoid suture is the obliquely directed point of convergence of the anterior margin of the squamous occipital bone and the mastoid part of the temporal bone. 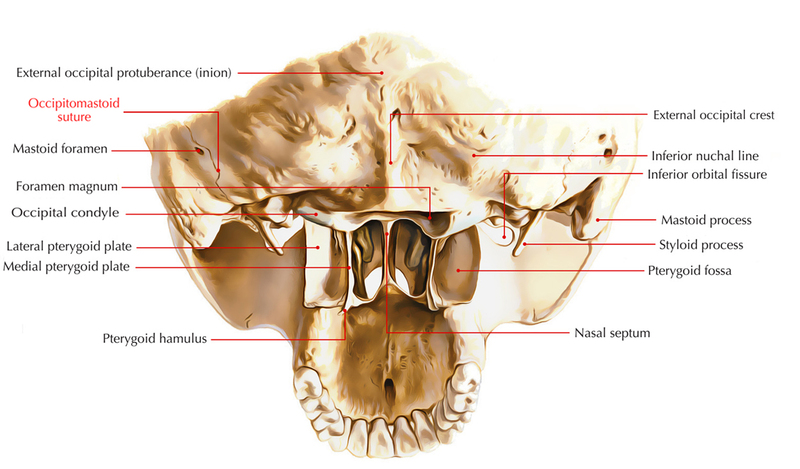 Sometimes, a mastoid foramen is located near or inside it. At the asterion, the occipitotemporal suture and the parietotemporal suture merge the lateral end of the lambdoid suture, which in the fetal/neonatal skull is the site of the posterolateral fontanel, which closes throughout the second year of life. A small triangular zone referred the jugular growth plate is the last part of the skull to show active age-related growth and is located posterolateral towards the jugular foramen in the occipitotemporal suture.